I received a lovely package from Revee yesterday. It was filled with smaller packages neatly wrapped in white tissue paper and each was tied in red satin ribbons. The contents of these packages were so sweet and just perfect for a Valentine treat! 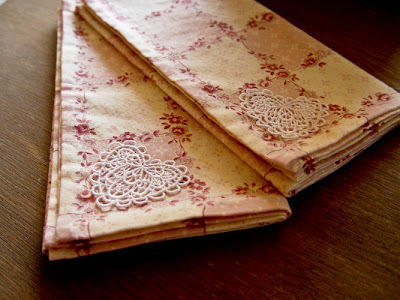 Revee made me two of her beautiful hand-hemmed napkins, each adorned with a heart-shaped medallion. They are exquisite! Such beautiful handwork! Very lovely! They will be perfect for a Valentine tea. 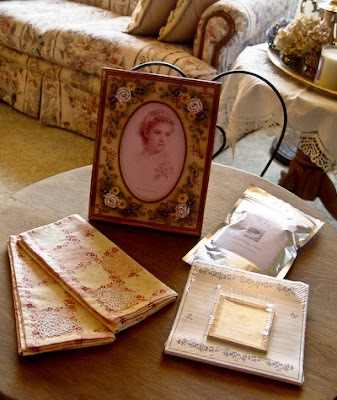 Revee also included a package of Morning Rose China black tea from Sterling Tea Company and a notepad with a small fridge magnet in the wrapper that says "Home is the Heart's Resting Place". Also enclosed is was a beautiful photo frame with three-dimensional roses, daisies, and forget-me-knots in lavender, yellow, and blue. Thank you so much, Revee. I am enjoying the contents and will think of you every time I sip on the Morning Rose tea and use my new sweetheart napkins! Beautiful napkins! What a delight to receive lovely things. Very nice swap gifts! The tiny heart doilies on the napkins are just the perfect touch!